But it's not as simple as sending in a coupon with your tuition bill. There are big hurdles for students, and clear benefits for the universities. It's called a MicroMasters and MIT, Columbia University, the University of Michigan and the Rochester Institute of Technology are among a dozen or so universities globally that are giving this online program a shot with courses like entrepreneurship, user interface design and artificial intelligence. Meet Danaka Porter. She's a 31-year-old business consultant from Vancouver, British Columbia, and says a master's degree was exactly what she needed to boost her career. "I found that people were a little bit more respected, I guess, once they had their master's," she says. "It was like they had taken that next step to go a little bit further." But she couldn't afford to stop working and become a full-time student again. She owns a house and, "I have bills, and all of that stuff that doesn't stop because I wanted to go to school," she says. When a friend told her that MIT was piloting its first partially online master's degree in supply chain management, she signed up. The tuition for a year in the master's program costs $67,938. Her MicroMasters certification, though, is just $1,350. It's called a MicroMasters because it isn't a full degree, just a step toward one, though Porter says the coursework is just as rigorous as if she were on MIT's campus in Cambridge. "It requires a lot of effort, and if you don't have a background in math, engineering or supply chain it's not a breeze. Like, we do have people that fail," she says. Even if students don't go for a full master's, the online coursework can make them more appealing to employers. Industry leaders who say they can't find enough qualified candidates are looking for very specific skills like those offered through the MicroMasters. GE, Walmart, IBM and Volvo have recognized MicroMasters and are encouraging their employees and job applicants to take the courses. Back to Danaka Proter, even if she passes the certification, she'll still need to complete a semester on campus at full cost if she wants to finish her graduate degree. It's part of what MIT calls the "blended" program — online and on-campus. Getting accepted is no easy task. MIT says it expects to admit 40 students a year into the blended program and admissions officers at MIT say they'll weigh applicants' performance in these online courses before admitting them. 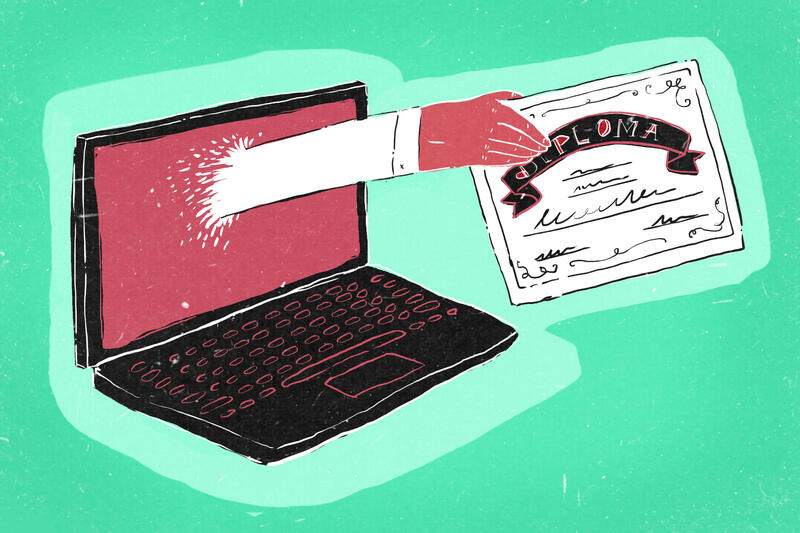 "When you get applications from people all over the world, it's often a crap-shoot," says Anant Agarwal, an MIT professor and CEO of the online-learning platform edX, which makes these online courses possible. "You don't know the veracity of the recommendation letters or the grades. And so you're taking a bet very often." And Agarwal says that should give MIT and other institutions a better sense of how students will perform — if they're lucky enough to get in. Read more about the story at WGBH's Higher Ed Blog, On Campus. WGBH's Lydia Emmanouilidou and Dina Kleiner contributed to this report. You know, going to school for a master's degree can be expensive. I'm talking really expensive, sometimes $50,000 a year, maybe even more. But now there is an experiment underway at several universities in the U.S. and abroad to bring down the cost of some master's degrees. Here's a story from Kirk Carapezza from member station WGBH in Boston. KIRK CARAPEZZA, BYLINE: Danaka Porter thought a master's degree was exactly what she needed to boost her career. DANAKA PORTER: I found that people were a little bit more respected, I guess, once they had their master's because it was like they'd taken that next step to go a little bit further. CARAPEZZA: The 31-year-old business consultant from Vancouver, British Columbia says the problem was that she simply couldn't afford to stop working to become a student again. PORTER: You know, I own a house. (Laughter) I have bills and all of that stuff that doesn't just stop because I wanted to go to school. CARAPEZZA: When a friend told her that the Massachusetts Institute of Technology was piloting its first partially online master's degree in supply chain management, she signed up. The first year of the program on campus would cost her $60,000. Her first semester online, though, is just a thousand. It's called a MicroMasters because it isn't a full degree, just a step toward one, though Danaka believes the coursework is just as rigorous as if she were on MIT's campus in Cambridge. PORTER: It requires a lot of effort. And if you don't have a background in math and engineering or a supply chain, it's not a breeze. Like, we do have people that fail. CARAPEZZA: And then there's this - even if she passes, Danaka will need to apply to the on-campus program to complete her master's, the second half at full cost. Getting accepted is no easy task. MIT only admits 40 students a year into its supply chain management graduate program. UNIDENTIFIED WOMAN: Who am I to dream of managing a global operations team? CARAPEZZA: Some top schools from around the world are on board with MIT. There's user interface design from the University of Michigan, entrepreneurship from the Indian Institute of Management in Bangalore and artificial intelligence from Columbia University. Even if students don't go for a full master's, the online coursework can make them more appealing to employers. Industry leaders who say they can't find enough qualified candidates are looking for these very specific skills. GE, Wal-Mart, IBM and Valvo have all recognized MicroMasters, encouraging their employees and applicants to take these courses. Some students who are enrolled in MIT's on-campus program wish these online courses had been available to them before spending more than $60,000 for their degrees. VERONICA STOLIAR: Yeah, I think I would have considered if this was an option. CARAPEZZA: Veronica Stoliar (ph) is a graduate student at MIT from Caracas, Venezuela. She quit her job in the oil industry to earn her master's in supply chain management. Ultimately, though, she thinks her on-campus experience will pay off. STOLIAR: The income boost from it. It's more expensive, but also you're getting also experience of living in Boston, interacting with people from MIT that might not be in supply chain but might be in, like, the business school and other types of departments. CARAPEZZA: You might be wondering, what's in this for MIT? Admissions officers here say they'll weigh applicants' performance in these online courses. And MIT's Anant Agarwal sees it all as a way to filter the applicant pool. ANANT AGARWAL: So you get applications from people all over the world. It's often a crapshoot. You don't quite know the veracity of the recommendation letters or the grades. And so you're taking a bet very often. CARAPEZZA: And Agarwal says that should give MIT and other institutions a better sense of how students will perform if they're lucky enough to get in. For NPR News, I'm Kirk Carapezza in Boston. (SOUNDBITE OF PROEM'S "DEEP LIKE AIRLINE FAILURE") Transcript provided by NPR, Copyright NPR.